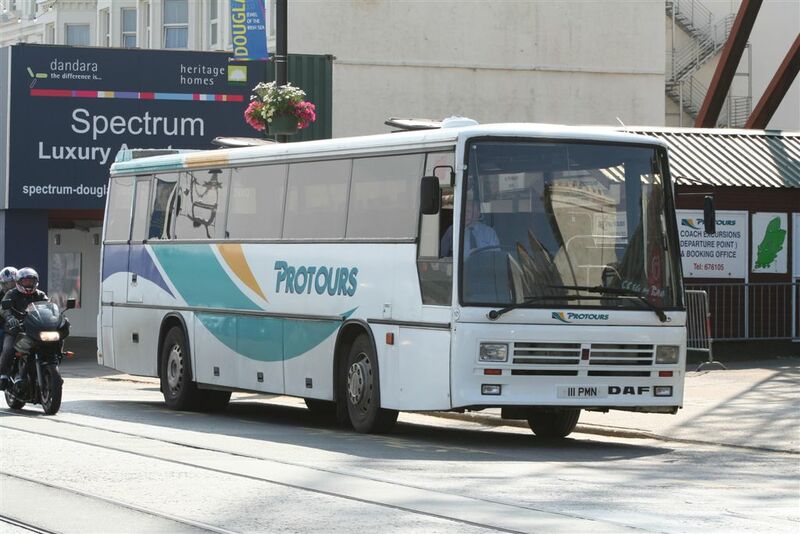 Towards the latter part of 2003 the operations of Tours (Isle of Man) passed to Protours (Isle of Man), who introduced the Protours fleetname and an attractive livery of white with yellow and green flashes and embarked upon a vehicle upgrading policy. Initially this included three Turksih built BMC Probus 850 Club mid-sized coaches, although not all came to the Island first, some going to the UK arm of the operation. 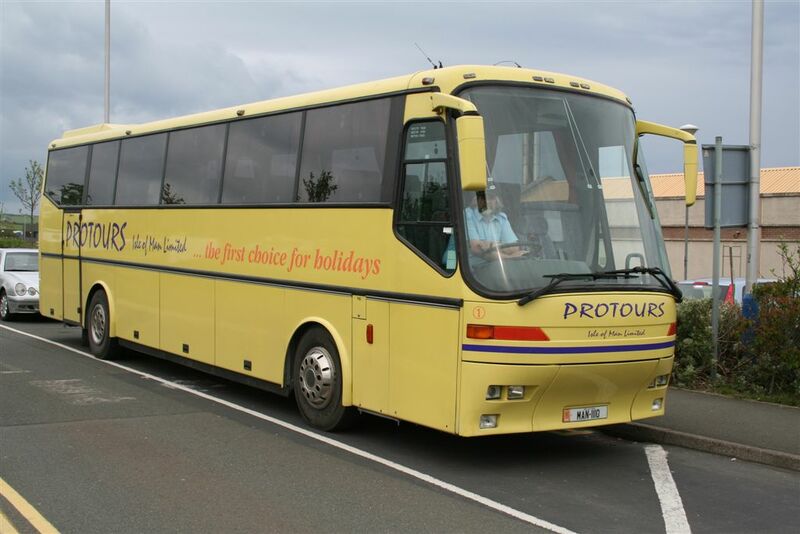 After these vehicles added to the Island part of the Protours business usually comprised coaches cascaded from the UK operation or selected second-hand purchases. Initially based in the former Tours (IOM) depot at Summerhill, Douglas, at the end of 2008 the business was relocated to premises on the outskirts of Ballasalla, near to Ronladsway airport. 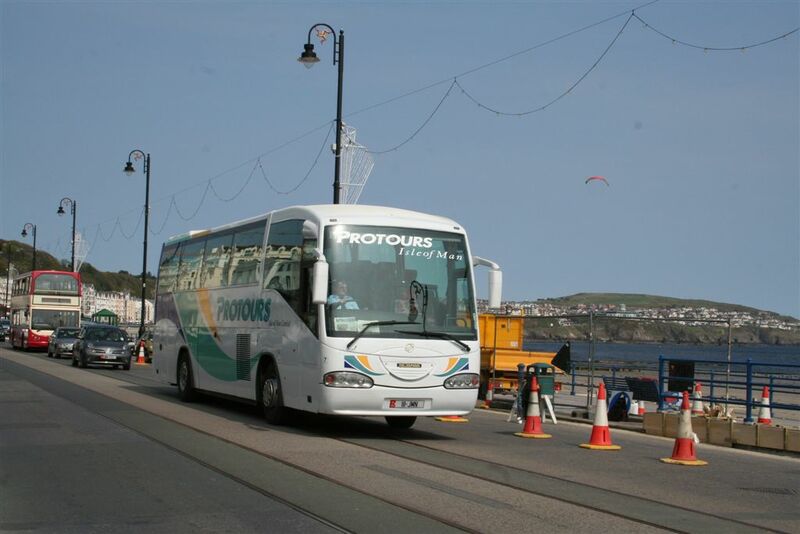 With effect from January 1, 2012 Protours sold the Isle of Man business, having previously sold or closed down the UK operations, back into local ownership, with the fleetname reverting to the former identity Tours Isle of Man. 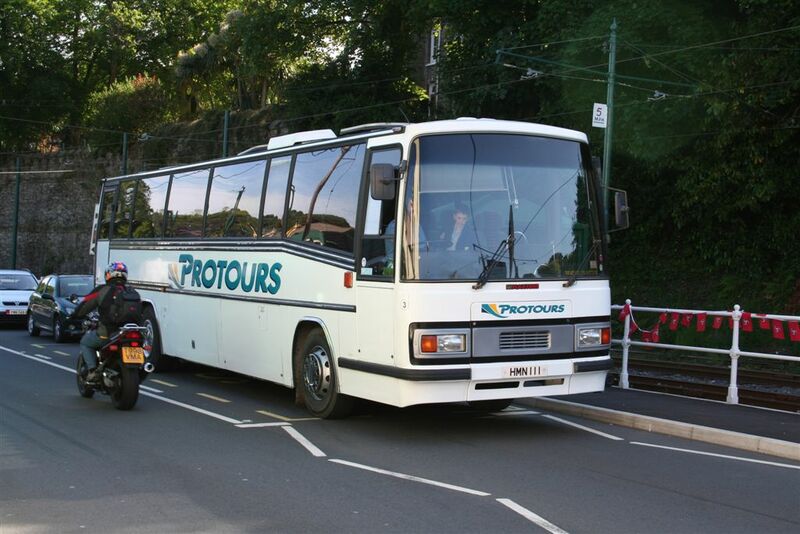 Below are a selection of photographs showing some of the vehicles operated by Protours (IOM). 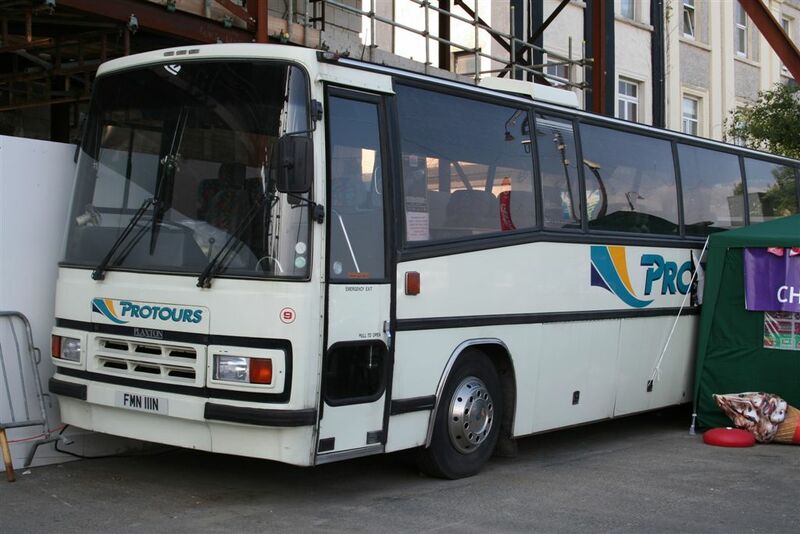 Following the change of ownership to Protours, a number of older coaches were withdrawn and sold or scrapped in conjunction with a fleet upgrading programme. The first coach to arrive was a new 35-seat BMC Probus 850 Club which was also the first to carry the new base white livery. Registered BMN 111C, and numbered 850/1 it is captured at Summerhill depot alongside Plaxton bodied Bedford 7, whose registration it has taken. The Bedford was withdrawn and sold for use as a race support vehicle. Driver Andy Hurd waits with Bova Integral number 1 (MAN 1110) on the coach parking area at Ronaldsway Airport awaiting a party. Plaxton bodied Bedford 3 (HMN 111) draws to a stop in Laxey on a school journey. Irizar bodied Scania 7 (111 JMN) with driver Bernie May at the wheel, makes its way along Douglas Promenades en route to the boat. One time Port Erin Hotels Plaxton bodied Bedford 9 (FMN 111N) sits at the coach stand on Douglas Promenade. The coach had been withdrawn some months earlier and was being used for non-psv work. 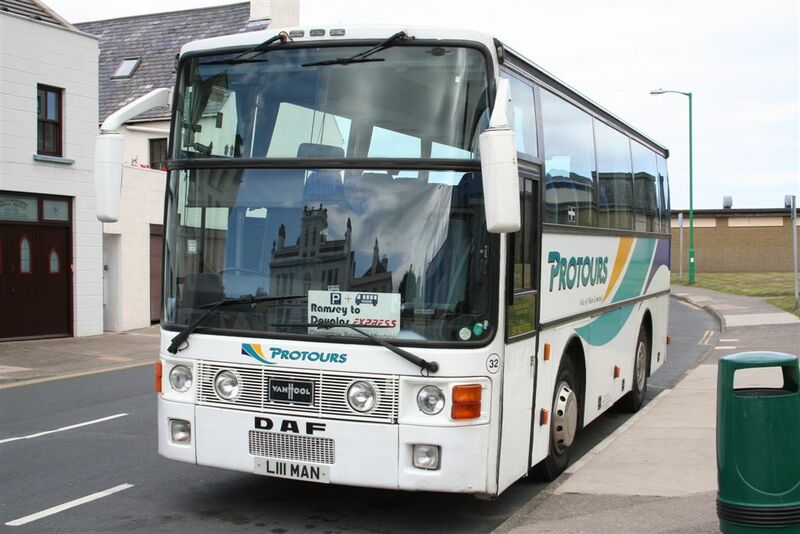 The first of the Duple bodied DAF's acquired by Tours (IOM), Protours number 10 (111 PMN) waits outside Douglas Promenade booking office between journeys.